Items listed on this page are miscellaneous sales offered for sale from time to time. An auction of Tristan da Cunha artefacts, normally donated by members, is a popular feature of the Tristan da Cunha Association Annual Gathering held in the Holiday Inn at Southampton on the Saturday after Easter - see the Association Section for details. 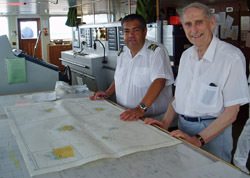 has paid £145.03 to the Tristan Education Trust Fund as a result of his sale of annotated navigation charts donated by Captain Rodney Young on return leg of the 2011 RMS St Helena voyage. 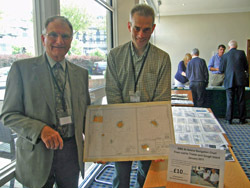 The joint winners of one of the charts, Simon Levell and Gerald Buck decided not to tear it and have half each, but use it to raise further funds, this time for the Tristan Education Fund. who was then Tristan Fishing Factory Manager ~it has a hand-written note in the corner: "To Glen Norton from Roland Svensson with thanks and friendship." (whose father Basil Lavarello worked with Glen and later became Factory Manager). Tristan Association Member Robin Webb has sold a unique radio on behalf of Tristan pensioner Nancy Swain on EBay. 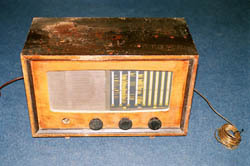 The radio was taken to Tristan da Cunha 1969 by Dr Keith C. Park and it was presented it to Nancy in the mid 1970's. She used it to listen to the BBC World Service, Tristan Radio and other stations. Proceeds will go direct to Nancy on Tristan. 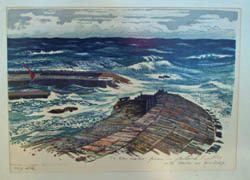 in a Fine Art Sale at their Cambridge Auction Rooms on Thursday 26th April. but it remained unsold as bids did not reach the reserve price. It is from a private collection in Bedfordshire. Edward Seago accompanied HRH The Duke of Edinburgh on HMS Britannia to Antarctica and the Islands of the South Atlantic in January 1957. 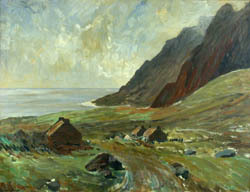 Together they visited Tristan da Cunha during the trip. The present painting is one of three versions that Seago painted of this view. The prime version is in the collection of HRH The Duke of Edinburgh. the islands' 500th Anniversary in 2006.